When Jessica of Craftiness is not Optional asked me to be part of her Olivia pattern tour, I jumped at the chance. I mean, have you seen her blog and all the amazingness over there? This girl has some sewing skiiiillllls. So that meant borrowing another cute little model… whose name just happens to be Olivia. Perfect! I went back and forth on my fabric choice for this dress, but in the end, I knew I had to go with this vintage thrifted floral paired with the bright pink corduroy. And the most perfect little vintage flower buttons you ever did see. The Olivia dress actually isn’t just a dress… the pattern gives you options to make it as a top too. Plus you can do sleeveless, short sleeves, or elbow length like I chose. Oh you know I love options! The pattern calls for elastic around the sleeves, but I added a couple of pleats to the sleeves so that I could use the bias tape again. Because it is just too yummy not to use! This was the first pattern from Craftiness is not Optional that I’ve ever sewn, and I was definitely impressed. It all came together very well and her directions were exceptionally clear. She paid attention to all the details – and when you look at the finished product? Love. It. I ended up getting sick over the weekend, so I only had one night to get it finished on time, and it was no problem at all. Two hours from start to finish, including cutting out the fabric … and maybe probably some Instagram breaks. Okay really, how does her mama not give her every little thing she ever wants?! So. Darn. Sweet! Two of Jess’s patterns on sale right now: The Junebug Dress [so so cute] and The Olivia [I think you know how I feel about this one!] — so make sure you check them out. But…. 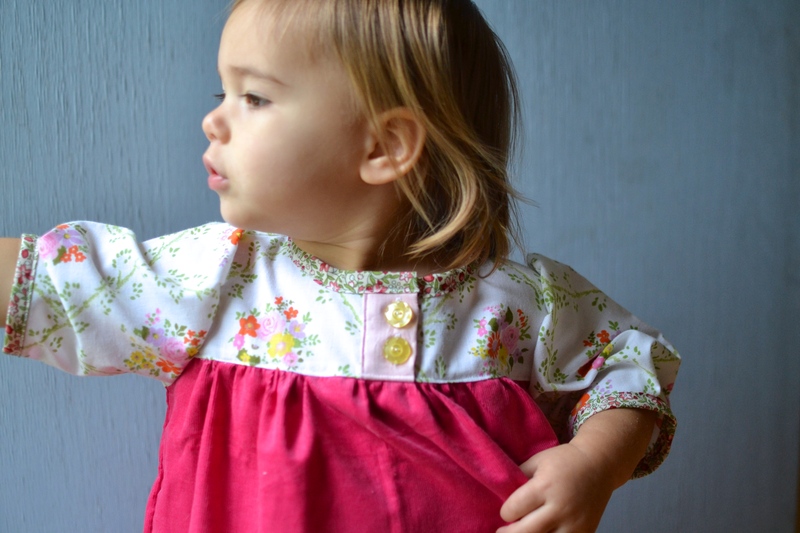 one lucky reader will win their very own copy of the Olivia Dress pattern! Yay! And head over to Craftiness is not Optional to see all the other ah-may-zing dresses and tops on the tour. So, so lovely. Very pretty fabric pairings! so cute. I love your choice of fabrics! And the buttons-oh my! I would love to make this dress for my two girls, they would both look so adorable in it. I love the fabrics you used! I’d love to use this pattern for my girls! I’d make it for my daughter. I’m make it for my toddler! I have a 4 year old daughter and I know she would love this dress. so, so lovely Jess. I am in love with all the vintage touches! And now I’ll have to make one with a pleated sleeve !Thanks a million for being on the tour! Lovely version of the Olivia! I’d love to make one for both of my daughters! I would love to make one for my little girl. Love this! My 1 year old would be so cute in this dress. Very cute! I would make coordinating dresses for my two girls! 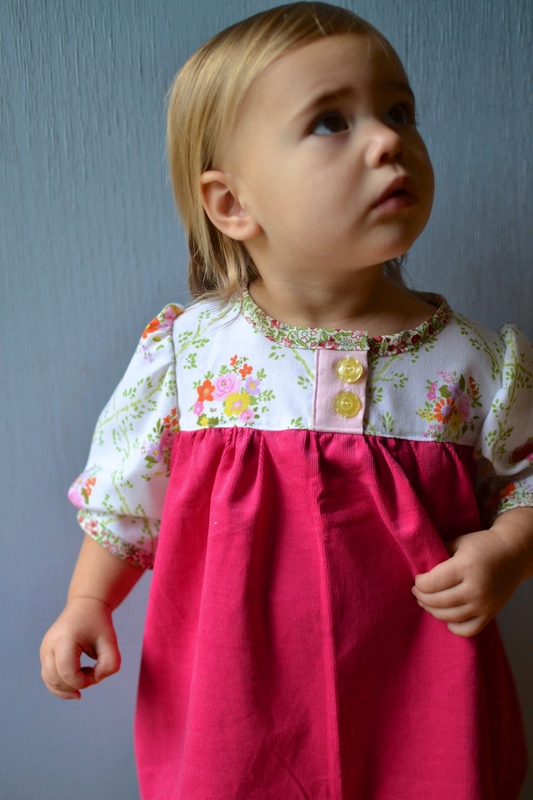 I would make the Olivia Dress for my three-year old daughter. Thanks so much for the giveaway! Beautiful colour combos! I would love to make this for my daughter eve… All the way in Australia! I would make it for my daughter! Absolutely love your version. I would make it for my daughter. Adorable! I would make this dress for the 3 of my 7 daughters that this pattern size range goes. Love it!! i’d make it for my daughter! I’d love to use this pattern to make some tops/dresses for my three daughters! I would make the cute dress for my granddaughter. Thanks for the chance. If I had a daughter I would make this sweet dress for her. Way to bring back corduroy it’s such a lovely fabric. I would love to win this pattern. My DGD will be one soon and it will be so nice to be able to make her a dress, tunic and top. Thank you for the chance to win. So adorable, makes me want to go out and buy a vintage sheet! I would make it for my two twin daughters and or a friend of mine that has a foster child. I’d make this as a top & dress for my daughter. So cute! 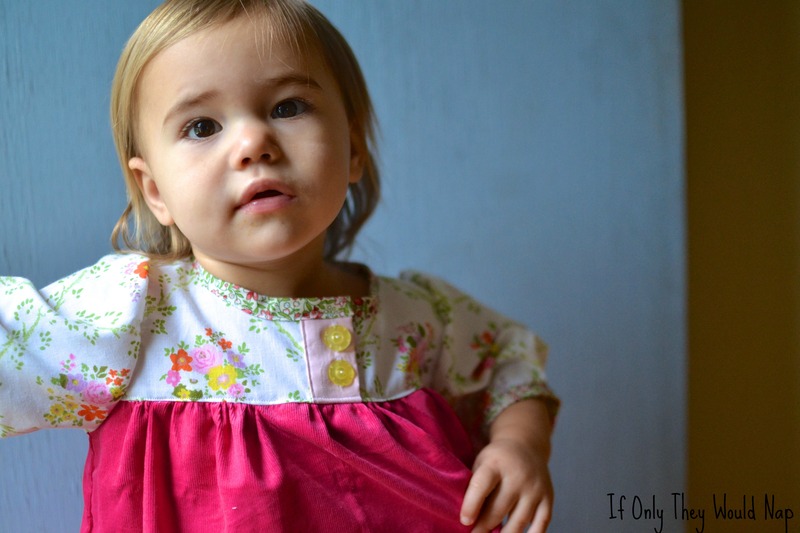 What a sweet dress, would love to make it for my two one year-old granddaughters! I would like to and have made this dress for my two little Granddaughters. Very quick and easy pattern and so cute. 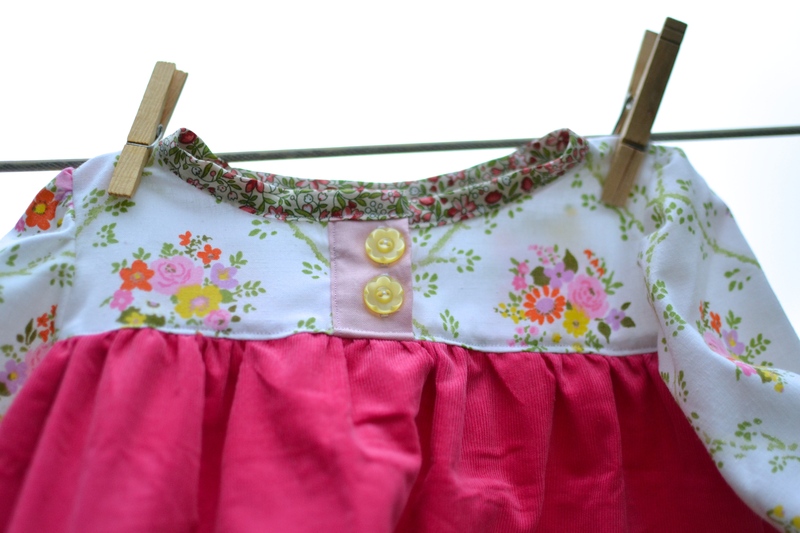 This makes me want to go get a vintage sheet right now to make this for my 1.5 year old daughter! I would make this for a very special little girl. I have no kids so whenever I get patterns I always give away whatever I make. You did great! So cute ❤ would lov to win! I would make one for my lovely daughter. I already saw a glimpse of your Olivia dress of craftiness is not optional and I love it. The combination of all the different fabrics that come together really great. It’s the best one I’ve seen so far on the tour! That is such a sweet thing to say! Everyone’s dresses have been amazing, so that means so much! Thank you! I’d love to make this for my daughter, it’s adorable!! So adorable. I’d make one for my new niece! I’d make it for my daughters.